Snow is on its way, and if your resolution for the New Year is to live a greener life, radiant snow melting systems are a great place to start. Electric snow melting is simply kinder to the environment. Clean, silent and compatible with renewable energy sources, electric snow melting doesn’t require harsh snow melting chemicals or additional snow removal equipment, saving your driveway, lawn and surrounding landscaping and your budget. Radiant snow melting systems use an automatic sensor that automatically activates driveway heat when precipitation is detected and temperatures are below 39 degrees Fahrenheit. System response times are fast, so chances are good that your driveway will be clear long before your boots ever see pavement. 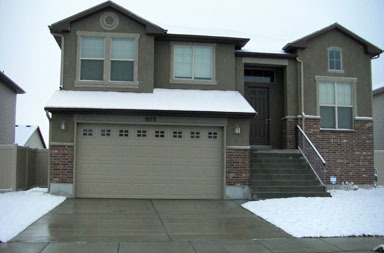 There’s no back-breaking shoveling, waiting for a snow removal service, or supplemental snow melting chemicals required. Unlike electric snow melting systems, snow removal chemicals have a negative impact on your lawn and surrounding landscape. Direct contact from salt spray from roadways, or from salt-laden snow that has been blown or shoveled over them can create yellow, dead patches of grass on your lawn, and cause bud death as well as twig dieback. And salt buildup in the adjacent soil formed by the repeated yearly applications of ice melting chemicals can damage plant roots, rendering them incapable of taking up water. A high concentration of calcium chlorides can permanently damage your driveway. Heavy application of these products is most often the biggest culprit, which shortens the lifespan of concrete surfaces. In addition to the damage caused by harsh chemicals, chain marks, scratches or gouges often result from the snow removal equipment used by well-meaning commercial snow removal companies. Unlike radiant snow melting systems, there’s also a potential for damage to landscaping that comes with hiring a snow removal service. Perhaps at this point you’re wondering just how much green a radiant snow melting system is going to cost you. Once you get past the initial cost of installation, operating a radiant heated driveway will literally cost you pennies on the dollar. Once you decide on your heating requirements, Warmzone is there to design a system to suit your needs, whether you’re outfitting a new concrete pour or an existing driveway. Warmzone has the experts and the expertise necessary to come up with an electric heated snow melting solution for your driveway that’s within your budget, without cutting corners on performance. Just think of all of the money you’ll save on lawn repair and snow removal services. Unlike other snow removal options, outside of that slight tick upward in your electric bill, there’s no snow blower to fill with gas, snow removal service to pay, or snow melting chemicals required. An electric snow melting system is self-contained and virtually maintenance free. Just set it and forget it. The snow will be gone before you even have a chance to warm up that morning cup of joe. And if your goal is to live off the grid to the fullest extent possible, it’s a good idea to include Warmzone radiant snow melting systems in your plans. They’re fully compatible with renewable energy sources, such as wind and solar power. Find out more about Warmzone radiant snow melting systems and their impact on a greener lifestyle by calling 888.488.9276. Read Warmzone’s Green Energy Statement. Electric underfloor heating systems are particularly well-suited for heating small to medium sized floors and areas. Electric radiant heating systems are energy efficient and cheaper and easier to install than hydronic radiant heating systems. Radiant underfloor heating systems are controlled by a thermostat with an in-floor sensor, and the systems are ideal for heating tile floors, hardwood, laminates and more. 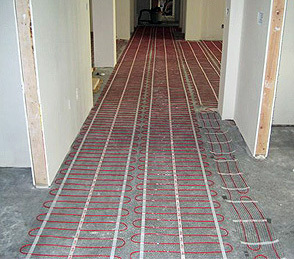 Electric radiant floor heating systems are also maintenance-free and feature rapid response times. One of the most proven and popular electric radiant floor heating systems is the ComfortTile heated floor. The thin ComfortTile floor heating cable has a ⅛-inch diameter, and when installing a heated tile floor, the cable can be installed in the thinset, so there is no need for floor buildup. In addition to being able to purchase the heat cable on spools, ComfortTile is also available in easy-to-install mats that can be quickly and conveniently rolled out during installation. The heat cable is pre-spaced and attached to a durable mesh with adhesive-backing. The heat cable on the spool is best for installing in large, custom shaped areas while the mats are typically used for heating standard shaped rooms and areas. Warmzone also offers several other electric underfloor heating systems, including the HeatShield floor heating insulation panels, In-Slab radiant heat cable, low-voltage FloorHeat systems and RetroHeat electric under joist floor heating systems. 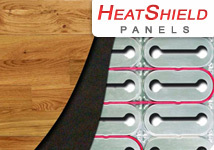 HeatShield underfloor heating insulation panels maximize radiant floor heating system efficiency. The systems are best suited for heating laminate and engineered wood floor applications, and are also commonly used for heating carpeted floors. Featuring ½-inch thick polystyrene insulation panels covered with thin, specially profiled aluminum, HeatShield floor heating systems ensure excellent downward insulation while optimizing the upward heat distribution, thereby reducing energy consumption. The underfloor heating system is also easy to install. Simply lay the insulation panels on the existing subfloor and clip them together, then press the heat cable into the grooves provided. (The reflective floor heating panels eliminate the need for heat cable to be embedded in a mud/cement base.) Next, place the finish floor on top. In-Slab (SlabHeat) underfloor heating cable is excellent for a variety of concrete applications. Ruggedly designed for installation directly in cement slabs, the In-Slab radiant heat cable produces 10-15 watts per square foot and can efficiently radiate heat to warm any type of flooring, from ceramic tile to marble, hardwood, slate, and more. 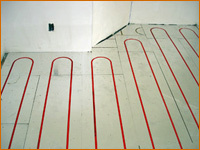 FloorHeat radiant heating systems feature a unique, self-regulating polymer heating element. This low-voltage underfloor heating system is extremely thin and requires no floor buildup. Because of these attributes and that it can be easily secured to the subfloor with nails, adhesive or staples, FloorHeat is ideal for heating hardwood floors. The system utilizes a step-down transformer that converts the 220 line voltage to the low voltage of 60V (or less). Existing floors can also be retrofitted with radiant heat, using the FloorHeat or RetroHeat under joist floor heating systems (providing you can access the floor joists under the floor you wish to heat). RetroHeat features a paper-thin heating element (available in 12, 16, and 24-inch widths) that can be cut on site and safely stapled between the floor joists. After stapling the floor heating panels between the floor joists, the electrical connections are made and common batt insulation is then installed to direct the heat up through the floor. The RetroHeat underfloor heating system is an outstanding value for retrofitting radiant heat under any existing floor covering, including tile, hardwood, and carpet. While Warmzone offers one of the best selections of underfloor heating systems available, it is best to call and speak with a radiant heat expert to determine the ideal system for your needs (888.488.9276). In addition to offering the best radiant heating products and systems on the market, Warmzone also includes complete radiant heat system engineering and design services. This ensures that your radiant underfloor heating system will perform as well – or better – than expected. Warmzone’s radiant heat design services include a detailed autoCAD of your system, so you’ll know all the system installation requirements and power needs prior to laying down any heat cable. So if you are considering installing a radiant underfloor heating system, deal with the best, most trusted radiant heat professionals at Warmzone. Call to speak to a radiant heat expert today, at 888.488.9276. Unlike many distributors of radiant heat products, Warmzone’s offering is not limited to just one brand or manufacturer. Rather, Warmzone works closely with manufacturers throughout the world in its quest offer the highest quality radiant heat products at the most affordable pricing possible. Subsequently, Warmzone is continually updating its product offerings. 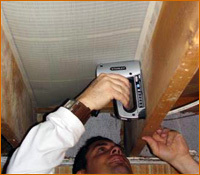 When new systems or products hit the market, Warmzone carefully researches and tests them to determine whether they should become part of the product line. This is a great benefit for consumers who are often overwhelmed with the vague, yet abundant volume of content offered online by less reputable radiant heat distributors. Consumers who work with Warmzone can be assured that the products and systems offered are at the very top of their class. In addition to offering the most tried-and-true radiant heating products on the market, Warmzone also includes complete radiant heat system engineering and design services (with autoCAD). “A radiant heating system is only as good as its installation,” Weaver emphasized, “so by providing complete system design services all potential issues are addressed prior to beginning the installation. This ultimately saves the consumer money by eliminating any costly surprises from arising during installation.” Warmzone also has an experienced master electrician on hand to provide support during the design and installation process. Through its website, Warmzone provides a wealth of radiant heat information, as well as radiant heating system installation manuals, technical drawings and product guides. The Warmzone website may be the most comprehensive collection of radiant heat information and documentation online. By reviewing the content, consumers can more effectively evaluate the radiant heat systems that are available. To view the radiant floor heating systems offered by Warmzone, visit our Radiant Floor Heating Overview web page. To learn more about the radiant snow melting solutions available, visit Warmzone’s snow and ice melting web page. Warmzone also offers proven roof heating and gutter trace radiant heating systems as well as portable snowmelt solutions. “We do the research and field testing to find the best products so that homeowners can visit our site and have a wide variety of tried and true solutions to choose from. No two installations are the same, which is why we customize each project to best meet the specific needs of the customer. You might be like many of us and are afraid to even say the word recession. If we say it then we’ll have to admit it’s really here and our spending choices have to be even more prudent. Economic downturns such as the one we find ourselves elbow deep in, dictate wiser, well-researched and more cost-effective purchases. The weak dollar and tighter credit allowances no longer allow the penny-pinching consumer the luxury of frivolous spending sprees. Each purchase needs to count and provide an investment for the future. A cost-effective investment and smart way to add value to your home is by installing a heated driveway (radiant snow melting system). Once installed, an affordable radiant heated driveway provides low operation costs in the long run, helping you lower your bottom line on home expenses. A heated driveway with an area of 300 square feet operates for under 50-cents per continuous hour of operation. 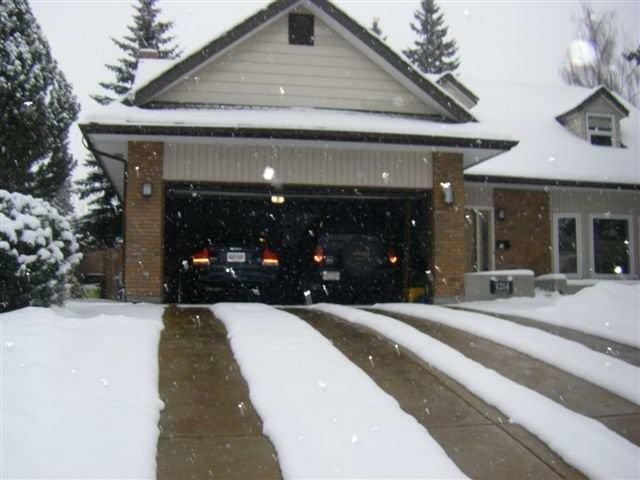 Snow melting generally only takes a few hours to clear your driveway when a storm hits. 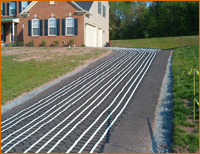 Driveway heating is an investment that has demonstrated and visible results. Not only does it allow you some free time with your family – not to mention saving your back from shoveling duties – but it is a proven way to protect the life of grass and surrounding vegetation by eliminating the use of salt and harsh snow melting chemicals. It also extends the life of your driveway by defending it from chemicals and other traditional abrasive snow removal methods. Radiant heated driveways are fully automated so you can stay inside where it’s warm and count the dollars you are saving as you watch the snow fall. An automatic snow sensor signals the snowmelt system’s controller when precipitation is detected and temperatures are below 39° Fahrenheit. The controller then sends power to the embedded heat cable, rapidly warming the driveway and keeping it clear of snow and ice. The system shuts off automatically after the storm. Electric radiant snow melting systems have an extremely fast response time, operate silently, and are maintenance free – and there are several options to choose from when considering a radiant snow melting system. There’s really no better, or easier way to keep your driveway clear of snow and ice during the winter than with a radiant heated snow melting system. So, instead of shoveling for hours after a Nor’easter or powerful lake effect storm, you can spend time relaxing inside with your family. The peace of mind that comes with making a smart purchase is invaluable right now. We are all looking for ways to ride out this (shhh, whisper) recession and worrisome economic climate, but you can still enjoy some of the finer things in life, and invest in wise products. Are you building a home, remodeling a room or retrofitting an existing living space with radiant heat but aren’t sure where to start? Warmzone has plenty of hot options for your next radiant heated floor project, plus the expertise and experience to support you—from budgeting and planning to design and installation. The foundation of many Warmzone radiant heat solutions, ComfortTile heat cable is the perfect off-the-spool answer for most custom-shaped floor heating projects, including bathroom floors, kitchen and laundry room surfaces. That’s because ComfortTile cable can be rolled out and configured to fit tight or unique areas other radiant heat products, such as mats or panels, can’t. It has a mere ⅛-inch diameter and can be installed under most floor types, including marble, ceramic tile and slate flooring without floor buildup. And every ComfortTile radiant heated floor system comes complete with GFCI protected thermostat and strapping to secure and properly space the heating cable for safe, easy installation. Of course, many radiant heat projects lack the dimensional challenges a unique layout presents. For these projects, ComfortTile cable is available in pre-configured mats. ComfortTile mats feature heat cable on an adhesive-backed fiberglass mesh. The cable is pre-spaced to maximize overall performance and take the guesswork out of radiant heated floor installation. 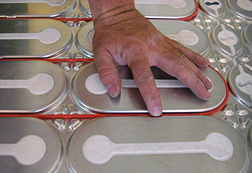 ComfortTile floor heating mats can be used in 120 and 240 volt applications, and require only one cold lead connection. The mats are available in various lengths at a width of 24 inches, and are flexible, practical, affordable radiant heat solutions for most homeowners and do-it-yourselfers. Are you ready to take radiant heat to the garden level? If you’re looking for a versatile radiant floor heating product that’s safe for use in both wet and dry applications such as basement floors, then Warmzone In-Slab heat cable is for you. Waterproofed and protected by a metal shield, In-Slab heat cable is great for a variety of concrete applications. Featuring an extremely fast response time, In-Slab heat cable produces 10-15 watts per square foot and can efficiently radiate heat through any flooring, from ceramic to marble, hardwood and slate, so it’s good for small and large areas alike. To get the best radiant heat system performance and efficiency in laminate or engineered wood floor applications, HeatShield radiant floor heating insulation panels are the way to go. The panels consist of a ½-inch thick polystyrene insulation covered with a thin, specially profiled aluminum that reflects all the heat up through the floor in the most efficient manner possible, so you get a nice, even heat radiating up from the floor that you can feel from your head to your toes. Installation is easy—just lay insulation on the existing floor, clip the panels together and press heat cable into the grooves provided. Then, simply lay the laminate or wood flooring on top. Installing a HeatShield radiant floor heating system. Looking for a radiant heat solution that can deliver safe, even, efficient heat distribution under a variety of surfaces? From heating tile, to stone, resilient, laminate, hardwood and carpet, no other radiant heating element can match the properties of FloorHeat. Low-voltage, self-regulating FloorHeat is a thin polymer heating element that has no effect on floor buildup, weight loads or flooring choices. It’s easily secured to the subfloor with adhesive, staples or pegs, and can be cut to length and installed under most floor coverings, making it a hassle-free choice for new construction and retrofit radiant heat projects. The system does require the use of a step-down transformer, which converts the line voltage (220 V) to the low voltage (60 V or less). Installing the RetroHeat floor heating element. It’s never a bad time to purchase and install radiant heated floors, because for every application, Warmzone has the experts and the expertise necessary to take on any radiant heat installation challenge. With RetroHeat, you can reap the same benefits of radiant floor heat without disturbing your existing floors. The RetroHeat under floor heating system consists of heating panels, connection materials, and unique digital thermostat that includes a 16-amp GFCI breaker and floor sensor for accurate programming. Heating panels are available for joists with 12, 16, and 24-inch spacing and can be cut on site and safely stapled between the floor joists to deliver warm, even heat throughout your home. To learn more about Warmzone’s complete line of radiant heat products, call 888.488.9276 today. So, instead of shoveling for hours after a Nor’easter or powerful lake effect storm, you can spend time relaxing inside with your family. The peace of mind that comes with making a smart purchase is invaluable right now. We all look for ways to ride out recessions and worrisome economic climates, but you can still enjoy some of the finer things in life by making wise investments in quality products. If you are replacing your existing floor with a new, radiant heated tile floor, then naturally, step one is to tear out the old floor surface. (In many cases, you can actually install a heated floor over an existing tile surface, but that often presents problems with door clearances and what not, so for simplicity, we’ll stick to removing the old floor.) Once your old surface is removed, make sure you have no sharp objects protruding from the subfloor and clear the surface of all dirt and dust. Next, lay out your ComfortTile heating element. 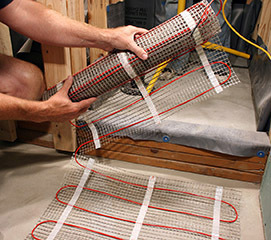 The ComfortTile heating mats feature heat cable that is pre-spaced and attached to an adhesive-backed fiberglass mesh that can be easily rolled out during installation. To make turns when laying out the floor heating mats, simply cut the mesh backing and turn the mat accordingly, (see photo). Never cut or damage the heat cable. When installing the heat cable off the spool, the cable is secured to the floor using thin metal strips (cable straps) that are nailed or screwed to the floor. These straps have small tabs in them where the heat cable is placed. Simply bend the tab over the cable to secure it. Once the cable and sensor are secured, you can install the tile. Using a large notched trowel, apply thinset directly over the heat cable. Another method is to pour a layer of self-leveling lightweight concrete over the heating mats. After that sets, simply apply the tile on the surface. This method is usually preferred among tile setters as it offers more protection for the heating cables when you are installing the tile. We live in an age of available information for do it yourself people. Imagine the difference you can make in transforming that cold floor into one of extreme comfort. A small radiant heated floor project could be done in a day or two, but the comfort will last a lifetime. ComfortTile floor heating systems from Warmzone are among the best in the industry and will provide you with reliable, energy-efficient, maintenance-free operation. You’ll not only increase your comfort, but the value of your home as well. 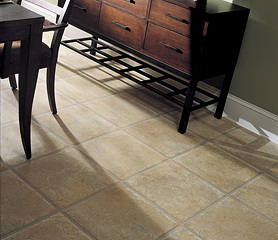 Ceramic tile floors are one of the most popular floor surfaces in American homes. However, one common complaint is that they are cold to walk on. Although tile is sturdy and beautiful, the “coldness factor” does carry some legitimacy. Let’s explore a way to resolve this issue and create an ideal flooring surface. We sometimes get conditioned as we walk around the house, making mental notes that it is uncomfortable to walk into this room or that room. Before long, we find ourselves avoiding half the rooms in our home. Well, it doesn’t have to be that way. A radiant heated floor can turn a room from one that you hesitate to walk in to, to one that you look forward to visiting. And these electric floor heating systems are surprisingly easy to install. After a radiant heated floor is installed it won’t take long for that conditioning to transition from an unpleasant one to one of considerable enjoyment. You won’t be avoiding the family room with the cold tile floor. Instead, you’ll be reveling in that room as your feet soak up the warmth from the heated tile floor. Heated floors are the answer to providing inviting warmth to tile floors. Installing a heated floor is not that difficult and it really beats the comfort of portable heaters or electric panel heaters. In some cases, you don’t even need to tear out the existing tile floor to install radiant heat. If you can access the floor joists from below, then you can retrofit your tile floors with luxurious radiant heat to create the beautiful, warm home you always envisioned. Warmzone offers two outstanding floor heating systems that you can retrofit your floors with, FloorHeat and RetroHeat. Call a radiant heat expert today to learn about these two systems and find out which one would be best for heating your tile floors. Of course, if you want to redo the tile floors in your home, then you can choose from a variety of other radiant floor heating systems to install with your new tile. The bottom line this: you don’t have to live with cold floors or cold feet. Radiant floor heat is an affordable option! 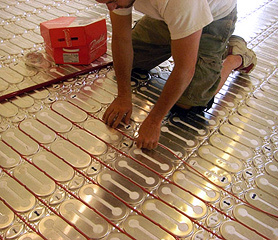 For remodeling jobs, you won’t find a better floor heating option than ComfortTile radiant heat systems. Install the ComfortTile heat cable (or mats) over the subfloor and apply your finished surface over that and you have a room that you will look forward to visiting. Sensors in the floor will communicate with the thermostat in the wall and keep that room just the way you like it. Not only does radiant floor heat eliminate “cold feet”, but the efficient heat rises from the floor to provide comfortable warmth for the whole room. Radiant heat is truly a luxurious heat that needs to be experienced to be fully appreciated. And each room can be controlled separately by its own thermostat, making radiant in-floor heating extremely energy efficient. The thermostats can also be fully programmable, so they can be programmed to warm the home just before you get up each morning and/or when you get home from work, or however you see fit. Radiant floor heating is here to stay, so don’t hesitate to learn more about your many options, and increase your comfort as well as the value of your home. Just make sure that you work with a reputable company that has truly earned the reputation of being among the best. And also, be sure to work with a provider that also includes full radiant heat system engineering and design services – like Warmzone. After all, a radiant floor heating system is only as good as its installation. What are the Best Options for Keeping Your Driveway Clear of Snow and Ice? Every year it comes, and every year we fight it. I’m talking about snow . . . lots and lots of snow. Sure, it’s pretty and helps to put us in a festive, holiday mood, but the truth is that snow can drain our wallets, sap our strength and even impose on our sleep or leisure time. Most folks who live in cold climates have become somewhat accustomed to getting up a little earlier or staying up a little later in order to shovel snow from their driveways or clear their roofs and gutters. Usually the shoveling of snow is followed by the disbursement of salt or other snow melting chemicals. Some homeowners – and businesses especially – opt to pay someone else to manually remove the snow. But is manual snow removal really the best way to rid our sidewalks and driveways of snow and ice? There is, in fact, another option – radiant heat. The heat cable features a thick wire that is surrounded by layers of insulation, copper grounding braid and a protective outer layer of PVC or polyolefin to form a flexible cable about ⅛ to ¼ inch in diameter. Cable is available on spools as well as in mats. These mats have the heat cable that is pre-spaced and attached to a mesh backing, and can be customized (cut) to suit virtually any type of layout, including driveways, ramps, common walkways and sidewalks, etc. The activation device for the snow melting system activation device can be either an aerial-mounted or pavement-mounted snow sensor. These sensors activate the system when there is moisture present and the temperature is below approximately 38 degrees. Most systems also include a manual timer to preheat an area before a large storm to curb snow and ice accumulation or to eliminate snow drifts. When the snow sensor detects the right conditions, it signals the control unit which then sends power through the heat cable. 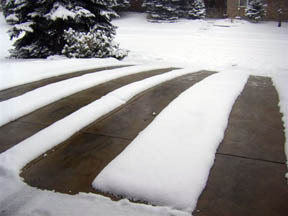 The system warms the surface quickly so that the first snowflakes melt immediately as they land on your heated driveway. What are the Pros and Cons of each Method of Radiant Heating? First of all, it is important to clarify that one method of radiant heat cannot claim universal superiority over the other. Both types of radiant heat are popular. That being said, each system does possess distinct attributes and advantages. Electric snowmelt systems utilize rugged heat cable that distributes heat evenly across the surface of the driveway or sidewalk. The heating cable is durable enough that it can be installed in new concrete pours, under pavers and even in harsh, high-temperature new asphalt construction projects. It is secured to the remesh and generally spaced at 6 inches while being embedded within about 2 inches of the surface. Energy Efficient – Electric radiant systems boast a rapid response time, heating the area quickly and efficiently (99% of all energy goes to snow melting, so there is virtually no wasted energy). Lower Installation Costs – Because electric systems can be installed quickly and easily, the installation costs are minimal. Maintenance Free – Electric radiant heat systems do not use any moving mechanical parts, so the system is virtually maintenance free. No Mechanical Room is Required – Electric systems consist of three main components: the heat cable, a snow sensor (activation device), and the controller. So, unlike hydronic systems that utilize a boiler and pump, there is no need for a mechanical room. SUMMARY: For small to medium sized snow melting applications, electric radiant heat is generally the best choice.